Experience and tradition of Słodkie Upominki, which has been producing advertising sweets since 1997, obliges us to constantly improve the production and quality processes. One of our strategic goals is consistent striving to maintain the highest standards of production. Customers, their satisfaction and loyalty are the most important things for us. We constantly modernise our machine park, we invest in modern technologies, machines, and production processes. We are doing our best so that company gifts ordered from us were always of the highest quality and safety. 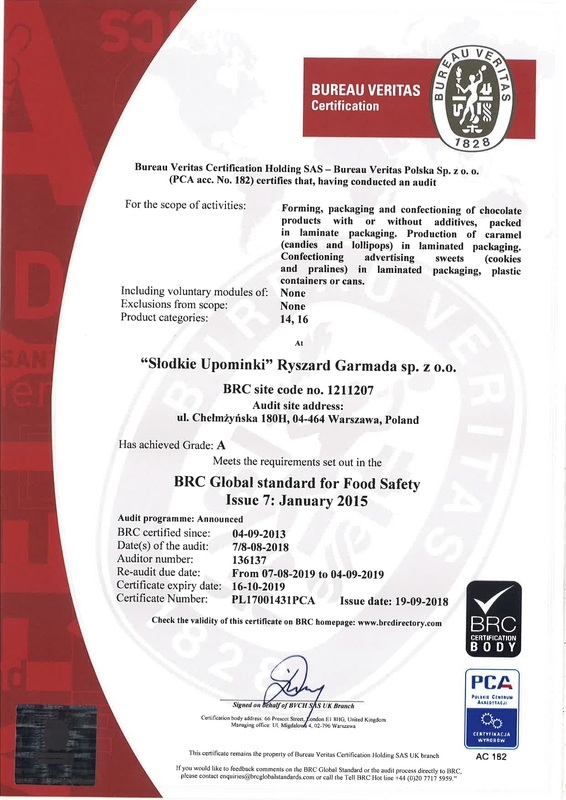 For this reason, in 2013, we decided to implement a BRC Food Safety Management System the proper functioning of which we confirm through an annual certification process by an accredited certification body. This standard is the guarantee of the highest level of safety of food, compliance with law and a consistent quality of products offered. It is also an assurance that the sweets produced are in compliance with the principles of Good Practices: Good Manufacturing Practice and Good Hygienic Practice (GMP and GHP), and the enterprise operated based on a thoroughly developed quality management system. – we analyse each complaint and report. 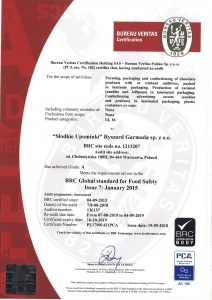 For the 5th time, we have been successfully certified as compliant with BRC Global Standard for food safety. As each year, we were marked with a higher mark and obtained an A.